This year, the appearance of Porsche at the AvD Oldtimer Grand Prix was clearly dominated by an automotive legend: the 911 Turbo. 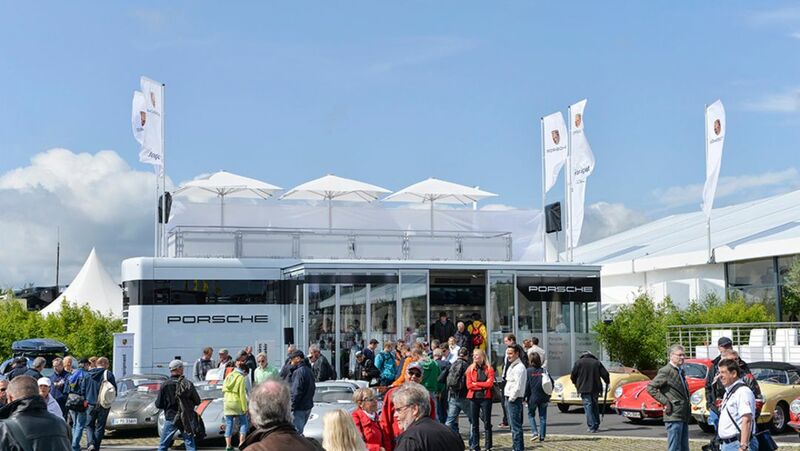 Just how multifaceted the history of Porsche is in general and of the 911 Turbo in particular was grandly shown to the visitors of the 42nd AvD Oldtimer Grand Prix. Porsche welcomed classic sports car enthusiasts from all over the world on a site covering more than 14,000 square metres and offered advice and consultation for repair work or spare parts supply of classic Porsche vehicles. 40 years ago, the Stuttgart-based sports car maker put the first 911 Turbo with motor racing technology on the road. With the standard Turbo model, Porsche heralded in a new era of high-performance sports cars in 1974. Planned, at first, as a prestigious limited series, 2850 units of the 911 Turbo 3.0 were produced during the first three model years. Thanks to the intercooler, the engine output achieved the magic threshold of 300 hp as early as 1977. In autumn of 2013, the company presented the newest generation of the 911 Turbo and the Turbo S.
During this year's Oldtimer Grand Prix, the experts from Porsche Classic – who have on offer more than 52,000 original parts as well as motor oils specially developed for air-cooled high-performance engines – presented 911 Turbo models and engines of various generations. In addition, unique exhibit pieces such as the 911 GT1, which won the last Porsche overall victory at the 24 Hours of Le Mans in 1998, plus a 356 Speedster restored from scratch were on display. Vehicles from the Porsche Museum, exhibit pieces from Porsche Exclusive and Tequipment as well as the Event Truck from Porsche Driver's Selection also started off on the Nürburgring. The autograph sessions with Derek Bell, five-time Porsche overall winner at Le Mans, Walter Röhrl, two-time rally world champion and long-standing development partner of Porsche, as well as Magnus Walker, Porsche enthusiast and founder of the "Urban Outlaw" fashion label, were the highlights in the Porsche Classic tent. The fans queued up to get the autographs they so hotly desired. Porsche Classic has celebrating 70 years of vibrant sports car history at this year’s AvD Oldtimer Grand Prix.